Yell, the Gateway to the Norther Isles and justly famous for otters is the second largest island in Shetland. Its long and varied coastline and stretches of uninhabited moorland have much to offer to wildlife enthusiasts, hill walkers and those who simply want a measure of peace and quiet. 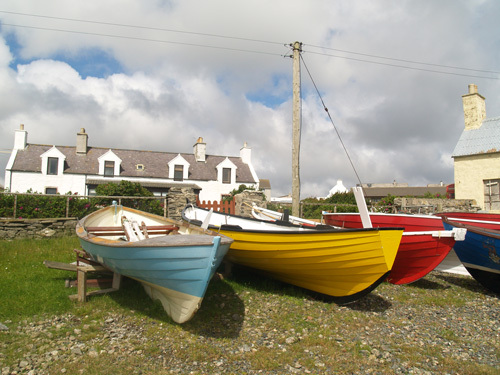 Yell also serves as a good base to explore Fetlar and Unst. From Toft, on the North Mainland, it takes only fifteen minutes by car ferry to reach Ulsta at the south end of the island. About 1,000 people live on the island and you will find a lifestyle which uniquely blends tradition with a full range of up-to-date facilities. Shops: Aywick, Burravoe, Cullivoe, Mid yell, and Ulsta. Petrol: Aywick, Cullivoe, Mid yell, Ulsta and West Sandwick. Public Toilets: Ulsta and Gutcher (Ferry terminals). Mid Yell and Cullivoe (Piers). Pubs and Places to Eat: Gutcher and Mid Yell. Post Offices: Burravoe, Camb, Cullivoe, Aywick, Gutcher, Mid Yell, Ulsta. Public Telephones: Basta, Burravoe, Camb, Cullivoe, Gutcher, Hamnavoe, Sellafirth, Ulsta and West Sandwick. Police. Churches: Cullivoe, Mid Yell, Otterswick, Hamnavoe, Burravoe and Sellafirth.